DOEprojekts, Deborah Adams Doering and Glenn N. Doering, were part of a series of performance and art encounters at MoMA. Internationally renowned artist Wafaa Bilal spoke on the history of performance related to social and cultural movements, then encouraged artists to work in groups and create "dynamic encounters" with the public in NYC. 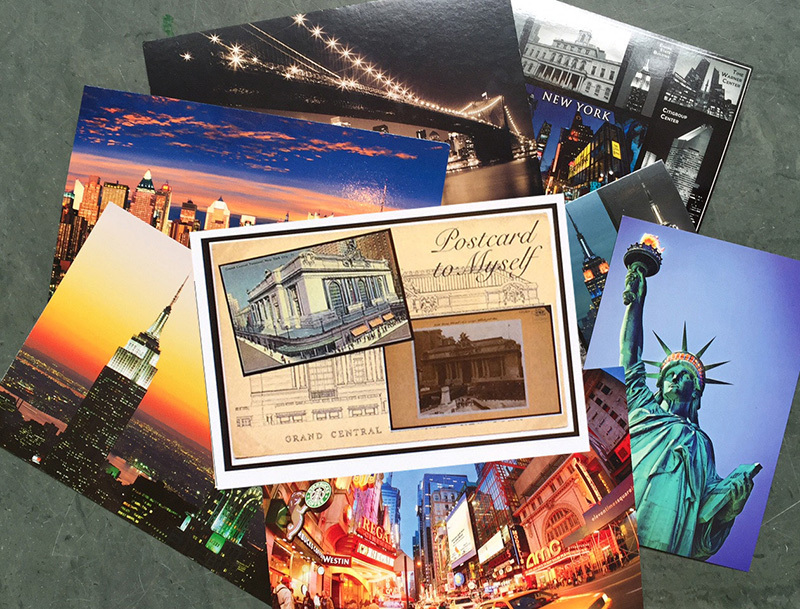 Our DOEprojekts' group efforts focused on two projects, one called "Postcard to Myself" and the other "Chat Pot Luck." 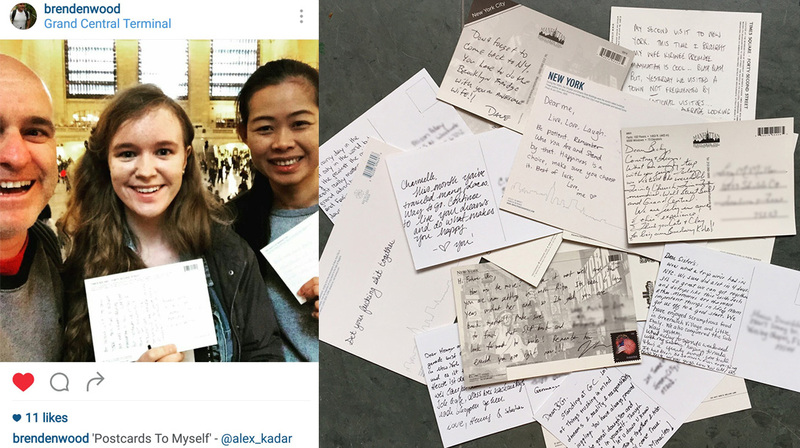 In "Postcard to Myself," we as artist-performers offered postcards to various persons moving through the Great Hall at Grand Central NYC, instructing them to write a postcard to themselves. The acceptance of the offer required an act of trust, since the postcard writer had to write a personal address on the card and give it back to the artist-performer, who pledged to mail the card "sometime in the future." 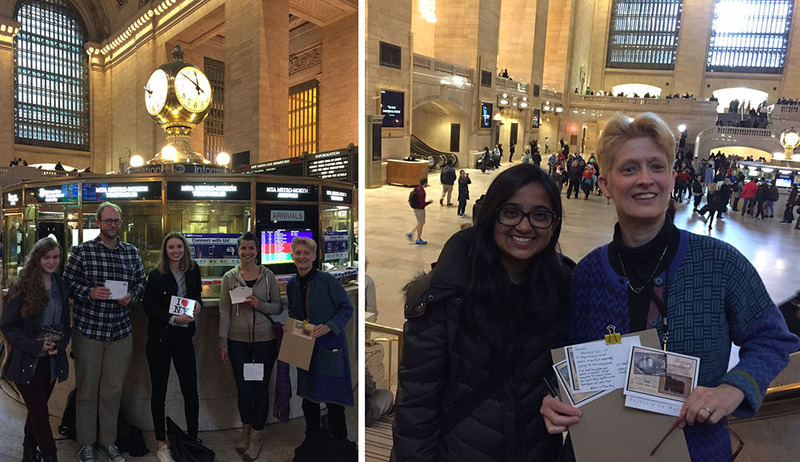 Over fifteen participants accepted the offer and several were willing to be photographed. 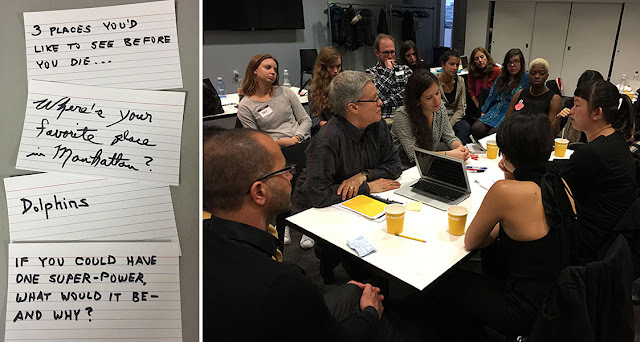 MoMA workshop participants (in addition to Deborah) included, CW Brooks, Alex Kadar, Cami Kupelian, and Amy Stoker. In "Chat Pot Luck," local Whole Food's cafeteria tables provided a place for artist-performers to interact with the public, inviting them to participate in conversation around specific topics written on index cards. Only topics written on the cards could be discussed. Whenever a person entered the conversation, they had to bring a topic/card, and when a person left the conversation, they had to take a topic/card with them. Upon returning to MoMA, each group presented images and responses to their dynamic encounters. Wafaa Bilal provided tactical suggestions for continuing each dynamic encounter. Artist-performers (in addition to Glenn) included Mariel Mok, Dusty Ros, and Natalie Nyu. 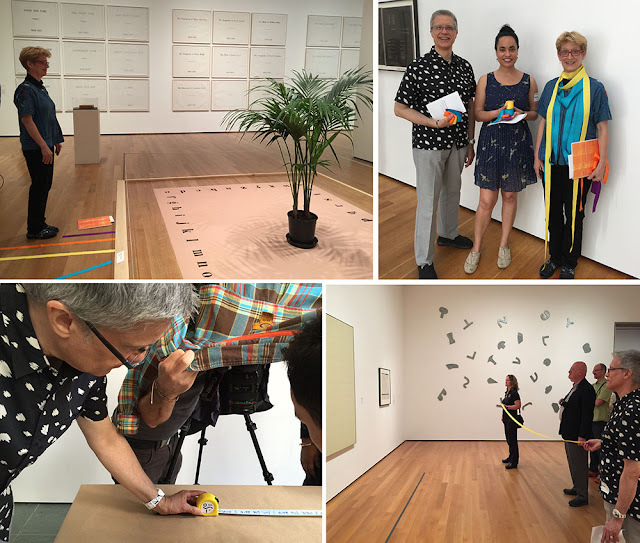 A week earlier, Artist-&-Public-Practitioner Chloë Bass facilitated a dynamic encounter titled "A Field Guide to Museum Intimacy," part of her "Book of Everyday Instruction." The study of human spatial requirements, proxemics, informed our artist-performance in MoMA's Marcel Broodthaers exhibition.